The gods of ancient Greece and Rome. They were myths, right? The stories of the Vikings, about the nine worlds and the trickster Loki and Ragnarok, those were just stories, weren’t they? The spirits of the British isles, they weren’t real, were they? What if they were true? What if the gods we think of as myth and literature actually walked the Earth in the dim mists of memory? What if they returned to our world, today? What if they wanted to be worshipped as they once were? And what would the implications of their return be on the modern world? That’s the idea behind ReDeus, a shared universe created by Bob Greenberger, Paul Kupperberg, Aaron Rosenberg, and Steven Savile, and readers can explore this world in ReDeus: Divine Tales, a new anthology from Crazy 8 Press that goes on sale in print in early August at Shore Leave 34 and as an eBook a few weeks later. The change promised by the ending of the Mayan Calendar in 2012 manifested itself in an unexpected manner. Every pantheon of gods and goddess, from every belief the world over, have returned … changing the world forever. As the pantheons settle into their ancestral lands, they vie for worshipers, gaining or losing power along the way. They find the world of man a bewildering, crazy quilt, and each wishes to remake their lands in their own image. Come and meet some of the inhabitants of this strangely familiar world in eleven new tales that explore what it means to worship in this new reality. A Knight Templar hunting mysteries. A rookie pitcher with a unique belief system. A wounded solider returned to battle by a goddess. A reporter who isn’t sure what to believe. A homicide detective on the Manhattan beat. A man out to kill the gods. A single father trying to survive in a world without Santa Claus. And many more! Chronicling this new tomorrow are Dave Galanter, Allyn Gibson, Phil Giunta, Robert Greenberger, Paul Kupperberg, William Leisner, Scott Pearson, Aaron Rosenberg, Lawrence M. Schoen, Dayton Ward, and Steven H. Wilson. Join them and discover a world where everything old is new again — even the gods themselves. Bob writes here a little bit about the creation of the book. Bob and his co-creators had stories of their own, set in their new world, but to package the book and make it financially worthwhile they needed a beefier book. Bob asked people they knew, people like myself, if they would like to contribute to the anthology, on the understanding that the deadline would be very tight. Three weeks tight, from pitch to final submission. I was intrigued by the concept, but I wasn’t sure immediately that I had a good idea that would work in this strange new world of gods and men. Sometimes the best way to find an idea is to not look for the idea, and while writing for work I kept a notepad handy so that if an idea for ReDeus came to mind, I could jot it down. I filled a half a page. The ideas behind the world of ReDeus fascinated me, and I saw ways of grappling with what I thought were the concept’s fundamental questions — What does belief mean in a world of gods incarnate? How, exactly, does one define a “god”? Once I started thinking in those terms — what’s the world like, how does it work, how does it affect people? — ideas began to flow. The story I pitched was not my first idea, nor my second. It was the third. I began writing in late-June, and I turned in the story a day before deadline. There’s philosophy and sociology and metaphysics and history and religion. There’s sunlight and there’s storms. There’s anger and there’s love. Yes, I wrote a baseball story. “The Ginger Kid,” by the way, is the nickname of Buck Weaver, the third baseman for the 1919 Chicago White Sox. (In John Sayles’ film adaptation of Eliot Asinov’s Eight Men Out, Weaver is played by John Cusack.) Weaver was banned from baseball for his involvement in the “Black Sox Scandal” in which White Sox players conspired with gamblers to throw the World Series. My story has nothing to do with Buck Weaver, mind you, though if you want to imagine my Ginger Kid as a young Cusack I surely won’t stop you. I just finished rereading the story myself — the page proofs were sent to me on Friday, and I’ve gone over them twice now. “The Ginger Kid” is different. If Ring Lardner’s baseball stories shaded over into magical realism, then they would probably look a bit like this. I enjoyed writing it. I hope that audiences will enjoy reading it. 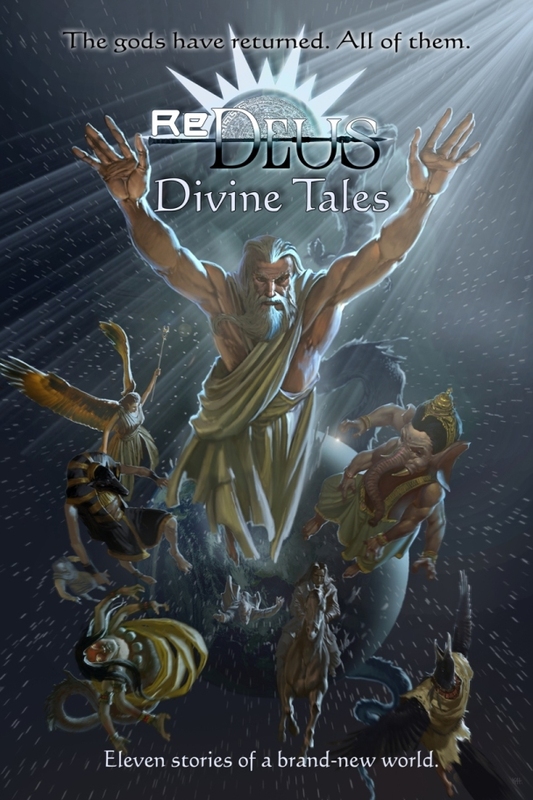 ReDeus: Divine Tales will be available in print at Shore Leave 34 in early August and as an eBook shortly thereafter.